Between art and wine in the heart of the Valpolicella .. ..
Property 4: Between art and wine in the heart of the Valpolicella .. ..
We had a wonderful stay while attending Vinitaly. The recommendation for taking the train into Verona was excellent. the station is a 10 minute ride to the station and It's one stop to the central train station in Verona. The apartment is well appointed and very peaceful. Nicely kitchen, comfortable beds, laundry and plenty of room. The only drawback is the ceiling height. If your over 5'10&quot; you need to be careful not to hit your head on the ceiling beams. But with that said great location, wonderful hosts, with good recommendations on resturants and local activivites. 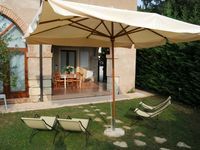 Impeccably kept and beautifully designed &quot;gem&quot; in this very lovely, quiet area of Colognola ai Colli. Barbara and her family have beautifully furnished this lovely casa for you to relax and enjoy! The kitchen is beautiful, bathrooms &quot;4 star&quot;, enormous windows open up to a beautiful country scene. Loved hearing the church bells throughout the day, making it even more magical. 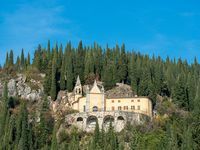 Don't miss the village and Castle of Soave, so close by. We will definitely share this &quot;find&quot; with friends who travel to Italy and hopefully, we will return one day. We all wished we'd had more time to explore this area, coming home to our storybook villa.